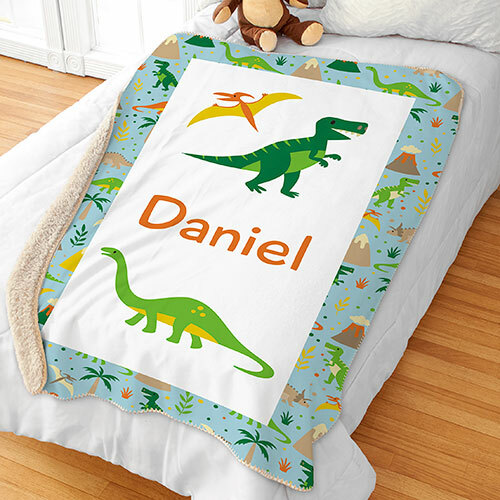 Make bedtime even more special and comfortable with your child's new Personalized Dino Sherpa Blanket. We will custom personalize this sherpa kids blanket with any name. very cute blanket a little thinner than I expected but it is warm! It also shipped very quickly! Amazing! Super soft better than expected ! I had these sent to my daughter in Wyoming. She says they are so soft and the quality is excellent. I love this company! Service is great, packages arrive in a timely manner. I have sent a total of 3 items to my daughter. I love this especially because my grandsons have unusual names and it’s impossible to find personalized things for them!